According to the Media Bloggers Association's Statement of Principles, "When we blog, each of us is accountable for our own actions, and we own our own words." The following comments - made by Bob Cox on his website, OlbermannWatch - reflect Bob's commitment to the principle that bloggers "act responsibly and with personal integrity." "Having already demonstrated what you ... are all about - lying, liberal, loons who all seem to think you might someday be the future Mrs. Olbermann - I don't see any further value in showing you all for the loons you are. You've done that suffeciently [sic.] for yourselves. If anyone else wants to bother with [the name of a Cox critic] here, she's in New York, she connects to the internet via a cable modem from Cablevision, she has an optonline.net email account and can found most days smoking her hash pipe and starting out the window looking for black helicopters. Drop me a line if you want the details necessary to chase [the name of a Cox critic] down the rabbit hole." This is abominable behavior. This is online terrorism. This is threatening. This is bullying. This is intimidation. Cox identifies the location of a person who has commented on OlbermannWatch based on the IP address. He makes a defamatory comment by stating that the individual has a drug problem. He invites OlbermannWatch readers to terrorize the individual by stating he has the requisite information. "I have been building my career showing up OlbyLoons like you and that is probably not fair - it's like bringing a gun to a knife fight." 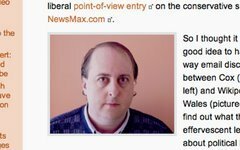 Here Cox unambiguously states that he is leveraging the recognition he has gained through OlbermannWatch to promote his "career" - which I assume to mean his career at the Media Bloggers Association. "If you are going to lie try to cover your tracks a little better or it take the fun out of my favorite sport - showing up Olby Loons for the fools they are." Cox admits that he thrives on instigating conflict. His "favorite sport" is to insult and belittle those who hold contrary opinions. Is this the type of person that you would trust to campaign for a code of blogger ethics? Is this the type of person you would trust to be the president of an ostensibly non-partisan organization?